Click an image to view it. Maximix Dispense Systems Ltd specialize in the manufacture of membrane base gas mixing systems. The system uses a semi-permeable membrane to separate nitrogen from atmospheric air and then mixes the nitrogen produced with CO2 from a gas cylinder or other external supply. 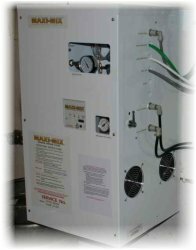 The Maxi-Mix system is easy to use and requires less cellar space than competing on-site gas generating dispense systems. The system produces 8.0 l/m of nitrogen. This high output can dispense up to 500 pints per hour without the necessity for external nitrogen storage. The system produces nitrogen with an oxygen content below 0.2 % and can be adjusted to produce gas mixtures with nitrogen, oxygen and CO2. Other gas mixtures are available on request. There are no complicated electronic controls or any electrical connections to the system. No filling of cleaning bottles or mixing of detergent with water. You have full control over the timing and the choice of cleaning, purging or rinsing your beer lines. Simple to operate - no electrical components or controls. Compact design, no cleaning bottles to fill or rinse. You have complete control over the cleaning process whether a purge, rinse, a clean and rinse or a longer clean is required. A consistently correct mix of detergent to water. Eliminate wasted product with purge line function allows you to sell off the line contents. Eliminate spillage and the use of goggles and gloves by avoiding handling of cleaning fluid. Save on water and cleaning fluid. Compatible with all known line cleaning products. Clean any length or drop of line. Dispense correctly mixed solution or clean water to clean and rinse cask ale lines and components too. Connects directly to the water supply and complies with water authority regulations.